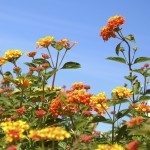 How to force spent blooms on lantana to rebloom during the summer? You will have to give it a rest period for recovery. Attempting to rebloom something that requires a rest is for temporary ornamental purposes, and usually causes the premature death of a plant. I would advise letting it complete its natural cycle, for the sake of its own life. Cutting them back can help start the rest period, and give it a boost for the next season, though.